What is the difference between a garden dahlia and an exhibition dahlia? Where can I see examples of each? 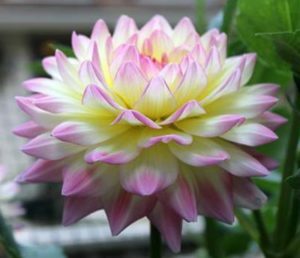 In response to this sort of question, Alan Fisher, The Chairman of the Garden Dahlias Committee has prepared a presentation showing a couple dozen dahlias, examples of garden dahlias, exhibition dahlias, and dahlias that work for both purposes. He also provided a brief critique in many cases – what is good and what could be better for the selected dahlias. The presentation is available in pdf form for all, and in PowerPoint format for members. The PowerPoint might make the basis for a nice meeting presentation/discussion.